50 Exhibitors offering Giveaways, Free Raffles and Live Demonstrations in the Gym. The Lions’ Club will be collecting used Eyeglasses. American Red Cross is hosting a Blood Drive 12:30-5:30pm (Register at American Red Cross website or contact Patti Mangini at 603-382-6541, x3900, Email). Please help the OWL FOOD PANTRY by bringing a non perishable food item. 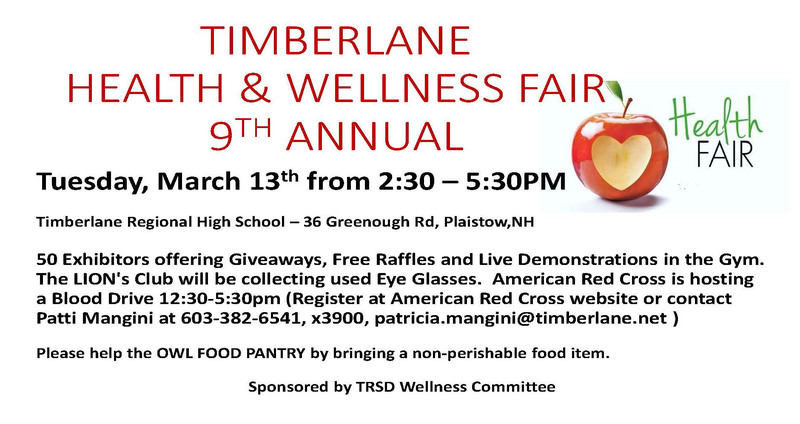 Sponsored by TRSD Wellness Committee.